Three German hefe-weizens — two from Munich and one (Julius Echter) from Würzburg. 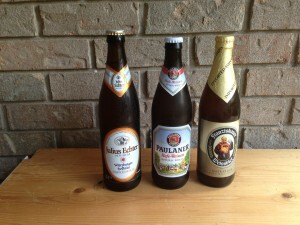 This is the second part in a series on German wheat beers. The first part was posted September 3rd. The basic grist for a wheat beer is wheat malt and pale barley malt (typically Pilsner). The classic ratio in a Munich-style hefe-weizen is 70:30 wheat to barley, but the proportion of wheat can drop to as low as half. When choosing a wheat malt, it is helpful to know some general things about the grain. About 90% of all wheat grown is hexaploid bread wheat. Most of the remaining 10% is (tetraploid) durum wheat, which is used mainly for pasta and never malted. Among the types of bread wheat are red or white, soft or hard and spring or winter. Red wheats are most often used for bread while white wheats are used for making pastries and cakes. Red wheat varieties generally have more protein than whites. Hard wheats are generally used for bread while soft are used more often for cakes, pie crusts, biscuits, etc. Hard wheats generally have more protein than soft wheats. Spring wheat — and especially hard red spring wheat — is made into high-gluten bread flour and is used for bread making and other hard baked goods. Winter wheat — and especially hard red winter wheat — is for making all-purpose flour and used in bread. Although malting barley varieties exist, and farmers design their fertilization schedules to produce low-protein (<12%) malting barley varieties, no wheat is grown specifically for malting. And, since higher protein wheat fetches a higher price on the market, farmers try to grow wheat with a high protein content. High protein content is great for baking, but leads to haze and biological instability problems in brewing. Most wheat malts are around 13–14% protein. The choice you face when buying wheat malt is likely to be red vs. white. Traditionally, German hefeweizens were made from red (winter) wheat, but white wheat malt will work as well. Despite it’s name, red wheat does not produce an amber colored beer; it is kilned to roughly the same Lovibond rating as white wheat malts (often 1.8–2.3 °L). If you are comparing two wheat malts and their protein content is known, pick the lower protein malt. Some brewers feel red wheat varieties give them better haze stability. Pilsner malt is your best choice for making a hefe-weizen, although other pale malts can be used. The classic wheat beer grist is just the two malts, wheat and barley, but you could make the barley malt component of your beer a blend of Pilsner and a small amount of either Vienna or light Munich. There is no reason to add crystal malts (or CaraPils) in a traditional hefe-weizen. You can use tiny amounts (less than 0.50 oz./14 g per 5.0 gallons/19 L) of darkly roasted malts — such as chocolate or black malt — to tweak the color a bit, but this is not a common practice. Adding the maximum amount of dark malt listed here would turn the color from straw colored to golden (and wouldn’t add any perceptible flavor). The type of Pilsner malt you choose — “regular” vs. undermodified — will depend on your mash program. If you intend on doing a single infusion mash, choose “regular” Pilsner malt. There are some reasons, that I’ll get to later, to perform either a step mash or a decoction mash when making a hefe-weizen. If you’re going that route, try to find an undermodified Pilsner malt. And keep in mind that if you decoction mash your wheat beer, it will pick up some added color in the mash. For malt extract brewers, your best bet is to add some base grains to your recipe formulation. This will enhance the malt aroma of your beer, and likely the haze. Do not steep light crystal or Carapils malts simply because they are steepable specialty grains. They don’t belong in a classic hefe-weizen. Make the effort to do a small partial mash with wheat malt and Pilsner malt. There are many wheat malt extracts available, with extracts having 50:50 ratio of wheat to barley malt being common. Finally, developing the spicy, clove-like wheat beer aroma is important in a German wheat beer. However, your malt choices do not influence to an appreciable extent. For example, contrary to what some sources claim, beers made with higher percentages of wheat do not yield wheat beers with more of the classic wheat beer aroma. That is primarily due to the yeast strain chosen, but can also be influenced by how you mash the grains, which will be discussed in the next installment of this series. I just wanted to post a comment to let you know I enjoy this new journal and read it everyday! I wanted to echo the comments of Rob. I now look forward to these informative articles everyday. Continued success Chris and James. Thank you guys. James and I are excited for our new venture and hope to make a journal that homebrewers enjoy reading and can benefit from.